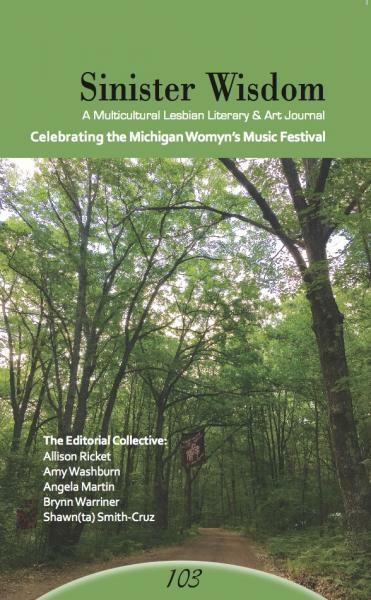 Sinister Wisdom 103: Celebrating the Michigan Womyn's Music Festival honors the forty-year legacy of the Michigan Womyn’s Music Festival (1976–2015). Sinister Wisdom 103: Celebrating the Michigan Womyn's Music Festival celebrates this embodiment of radical feminist separatist collaboration, transformational self-defined autonomous spaces, a commitment to sisterhood and matriarchal culture, and a musical city sprung from the earth for one week in the woods. A collective of five womyn each with a deep connection to Fest operated by consensus to create this issue. Striving to represent a range of womyn’s voices, values, traditions, and experiences of Fest, the collective highlighted what Fest has meant to generations of womyn, documented its chronology, and bore witness to the power of this community. Sinister Wisdom 103: Celebrating the Michigan Womyn's Music Festival includes womyn from multiple races, geographies, sexualities, generations, and gender and other social identities. Just as Fest brought together womyn from various backgrounds, our collection includes a range of artistic experience, from seasoned authors and photographers to those womyn new to publishing. Sinister Wisdom 103: Celebrating the Michigan Womyn's Music Festival remembers the transformations, possibilities, and hopes for spaces cultivating the ongoing empowerment of womyn. Order Sinister Wisdom 103 today or subscribe to Sinister Wisdom and receive a full year of the best lesbian literary and arts journal.